The Welsh government is to press ahead with its policy of fire sprinkers in all new homes from 2013, despite being told that it is not cost effective. Ministers commissioned expert analysis of the policy, which found that it would cost £6.7m per life saved over the next decade. This, the consultants concluded, was not cost effective. Environment Minister John Griffiths said there was a need to accept that there was a cost involved. Regulations will be introduced in September next year for all new and converted residential properties in Wales to be fitted with sprinkler systems. We must seek to prevent avoidable death and injury from house fires and need to accept that there is a cost to introducing sprinklers into new properties. Work is due to begin on the development of the regulations and the technical requirements necessary to introduce the Welsh law which will be subject to public consultation. Wales was one of the first countries to rule that all new homes are fitted with sprinklers but had set no timetable for its implementation. Ministers say it will save a predicted 36 lives and prevent an estimated 800 injuries between 2013 and 2022. The regulations is the result of the Domestic Fire Safety measure proposed by Ann Jones, Labour AM for the Vale of Clwyd, which was passed in the last assembly. According to UK fire statistics, there are an average of 2,168 fires, 17 deaths and 503 injuries in fires in residential premises in Wales every year. Mr Griffiths said: "We must seek to prevent avoidable death and injury from house fires and need to accept that there is a cost to introducing sprinklers into new properties. "These proposals are significant and important in taking forward fire safety. "Wales will be at the forefront of reducing fire risk and cutting the number of avoidable deaths and injuries caused by fires in residential premises." However, the government-commissioned cost benefit analysis from experts BRE Global found that between 2013 and 2022 the cost per life saved of the sprinklers policy would be £6.7m. 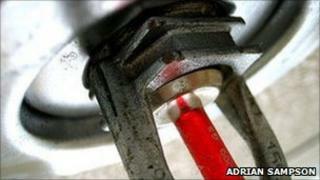 They concluded: "Fitting sprinklers in all new residential buildings in Wales would not be cost effective."